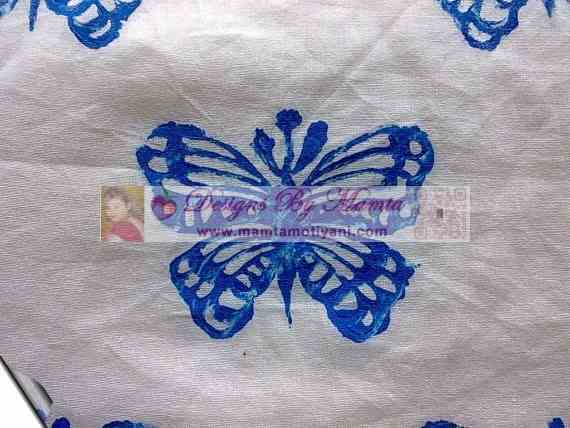 This butterflies block print fabric can be customized in any color that you want. I use traditional wooden handmade blocks to individually hand stamp this design on the fabric. The fabric I use is a white fine quality, light weight voile cotton fabric from India. The design covers the entire fabric with some gaps between to give it a aesthetic look. Each butterfly print measures about 2.5″ wide. Please note that this Butterflies Block Print Fabric will be made as per order. So it will take time to make it. I will keep you informed when it is made by me. You can send me your color choices too, by sending me the request through email before you order this fabric. This butterflies block print fabric is handmade fabric & not machine made. Hence, there will be certain amount of irregularity which is the charm of a handmade fabric. Depending upon the length of the fabric that you buy, you can put this fabric to various uses: Tablecloth, small window curtains, accessories, clothing, throw covers, quilting, Roman shades and other home decor purpose.